London-based model maker and founder of Chimerical Reveries Andy Acres invites you to “peer into another world” with his hand-crafted shadow boxes. Inspired by the art of storytelling, each enchanting model depicts eerie, abandoned scenes in miniature scale. Derelict farmhouses, old attics, and fog-filled forests are just some of the places you will find. Ranging in size, each shadow box features meticulous details, rich textures, and deep colors. Viewers are able to inspect Acres’ spooky scenes at different angles to discover intriguing, hidden details and envision their own story. Applying his background as a skilled illustrator, Acres starts by drawing out his scenes on paper. He then hand-draws each individual element and makes a photocopy before carefully cutting around it with a scalpel to make the stencils. His materials include soft wood, brass screws, plastics, and even real glass for the windows and the front of the box. The framed shadow boxes are back-lit with LED lights, which can be switched on and off using an antique toggle. Acre doesn’t stop working until his models are absolutely perfect. Only when the shadow boxes look “exactly like [his] drawings” does he feel like they are complete. You can purchase Acre’s shadow boxes through his Etsy shop. They may cost a pretty penny, but that’s the price of hard work. Peer into the eerie worlds of Andy Acre’s shadow boxes. This decaying greenhouse features broken windows and creeping vines. A freezing night lurks outside this crumbling attic. Beyond this gate lies a fog-filled churchyard. 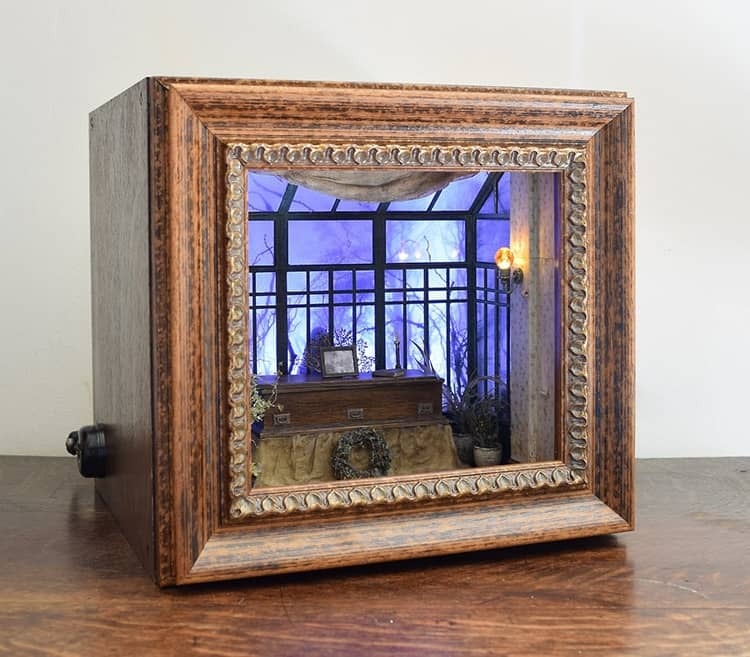 The post Model Maker Creates Spooky Miniature Scenes Framed Within Shadow Box Dioramas appeared first on My Modern Met.